← Latte Art Competition & 10th Anniversary Celebration at Cafe Helios Thursday May 31st! Want to try food prepared by some of the best Chefs in the Triangle? 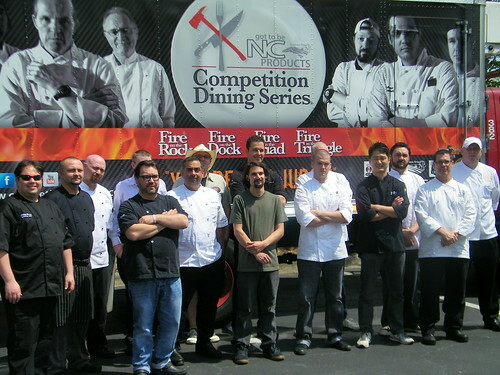 The Got To Be NC Competition Dining Series event, Fire In the Triangle, dining events kick off June 11 and conclude on July 31. The 15 dining events will be hosted at 1705 Prime, the area’s premier private event space owned by Rocky Top Catering at 1705 East Millbrook Road, Raleigh, NC 27609 (Map). Paying guests will sample each course in a blind tasting alongside a panel of culinary and celebrity judges in a series of 15 dinner competitions. Each evening, two restaurants “battle” it out side-by-side in a single elimination, “Iron Chef”-style format. Guests savor a six-course menu (three dishes from each chef without knowing whose food they’re tasting) created around a “secret” or “featured” ingredient. For almost all dinners, the ingredient will come from a North Carolina source. The secret ingredient is revealed to the chefs only an hour before they start cooking, and it must be used in each of their three courses. Diners, alongside culinary and guest judges, will rate each dish and determine who moves on to the next round and who goes home. At stake in each series is a grand prize of $2,000, a coveted “Red Chef Jacket,” and a hand-forged trophy by Gaines Kiker Silversmith in Blowing Rock, NC. The runner-up receives $500. Tickets for dinners cost $49 excluding beverage, tax and tip. The semi-final and final ticket prices are $59. Diners can attend as many dinners as they like. Tickets are on sale now at http://www.competitiondining.com Hurry. Seats go fast. The goal of the “Got To Be NC” North Carolina Competition Dining is to showcase North Carolina culinary talent and agricultural bounty. At each venue, a charitable donation will be made from a portion of the ticket sales to the Office of the State Fire Marshal in North Carolina to support local fire fighters, as cooking is the number one cause of house fires. Instructional tips about kitchen fire safety will be shared during the event. Sponsors include The North Carolina Department of Agriculture (NCDA), Southern Foods/ Pate Dawson, OUR STATE Magazine, Crippen’s Country Inn & Restaurant in Blowing Rock and H.ITS Technology. Local sponsors include the Greater Raleigh Convention and Visitors Bureau and Independent Weekly.